If you have a grudge against someone, you can access the Hell Correspondence website at the stroke of midnight, type in your grudge's name, and the Hell Girl, Ai Enma, will appear to grant your wish. However, the price for ridding yourself of such a burden is a steep one: in return for condemning the soul of your tormentor to Hell, your soul will also face eternal damnation. In her long vigil as the Hell Girl, Ai has met many willing to pay such a cost. 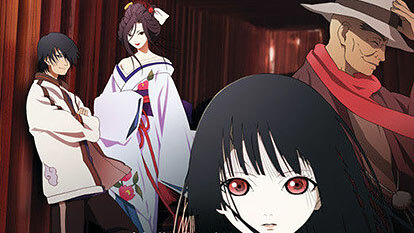 In Jigoku Shoujo: Yoi no Togi, Ai and her enigmatic companions continue to carry out their work, ferrying soul after suffering soul into the depths of Hell. However, as of late, a mysterious girl has been following them. This strange child, unable to even remember her own identity, questions Ai about her duty as the Hell Girl. Who is this girl, and what connection does she have to Ai?